Every guard is carefully hand finished, including curved & polished edges, easy peel no residue protective skin, for easy handling during installation. Worldwide airmail all with Tracking. 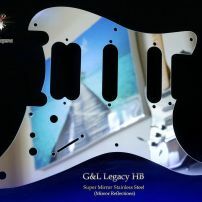 commented on "G&L Legacy Guitar Guard Chrome Metal Super Mirror SSS Pickguard Stainless Steel"
Seriously standout class! A solid Mirror Stainless Steel guard for your awesome G&L. Hit the stage with your shine on. Super mirror 100% non-magnetic corrosion free stainless steel, for the ultimate Legacy HSS or Tribute HB pickguard. 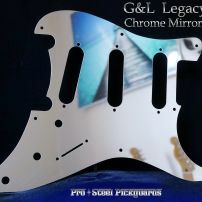 commented on "G&L Legacy HSS Guitar Chrome Pickguard Stainless Steel HB Super Mirror Metal Guard"
commented on "Silver Nova G&L Legacy Tribute Guard Stainless Steel Hand Machined Chrome Metal Pickguard"
Your G&L Gets More Amazing! 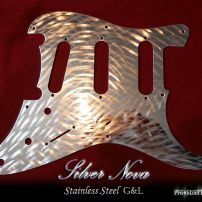 The Extra Bling of Silver Nova makes it Very Durable to Strong Playing Styles and the Furface Will Keep Looking This Way For Light Years Into The Future.